Hello fellow fudge fanatics! Are you craving a sweet treat? It doesn’t get any sweeter than these Chocolate Salted Caramel Fudge Bites. 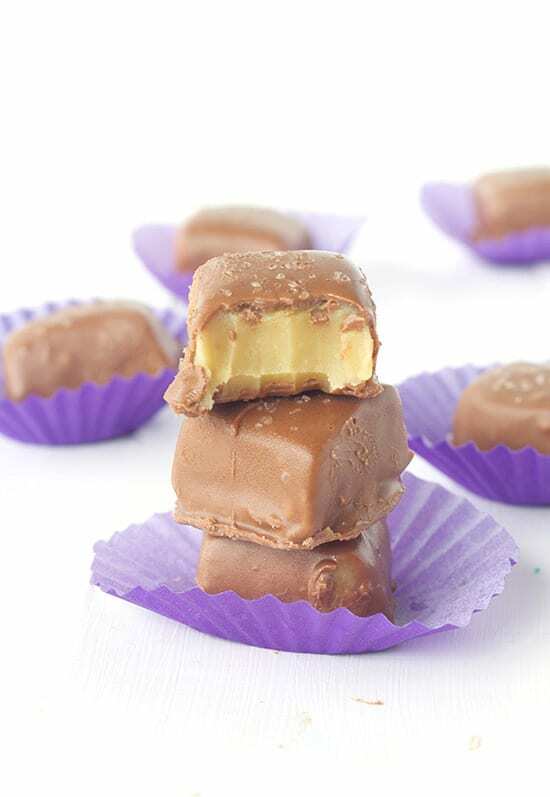 Creamy and soft homemade caramel fudge coated in milk chocolate with a dashing of salt. They make for a decadent bite-sized dessert or the perfect gift for friends and family. The fudge is simple and sweet, with a rich caramel flavour and a silky smooth texture. A sprinkle of salt cuts through the sweetness and the milk chocolate makes it perfect for chocoholics. Why not spoil your loved ones with a stash of these Chocolate Caramel Fudge Bites. Did you know making fudge at home is quite easy? And so rewarding! 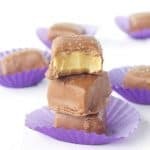 This caramel fudge is really delicious but it is also quite rich so whenever I make it, I am sure to cut the pieces quite small. You’ll end up getting at least 40-50 pieces out of just one batch. Plenty for you and plenty to share! One of the best ideas I’ve ever had was covering this fudge in milk chocolate which just takes it to the next level. You could also use dark chocolate if you prefer! I promise these Chocolate Caramel Fudge bites are like little pieces of caramel heaven. 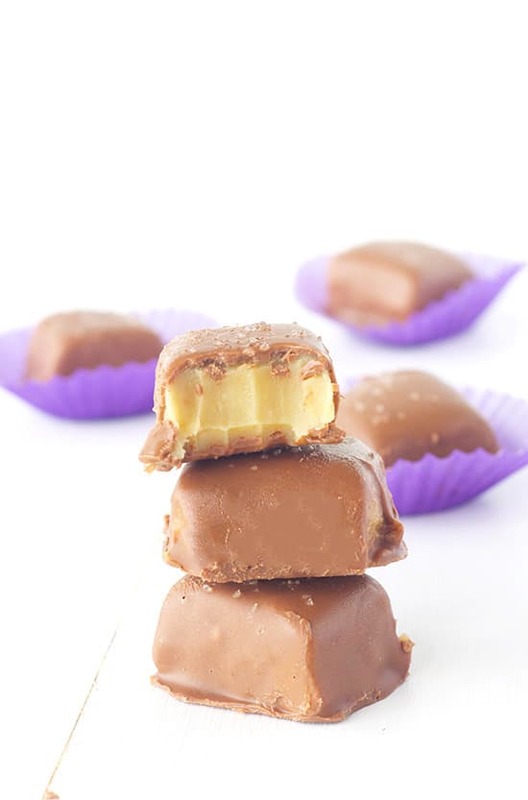 Creamy and soft homemade caramel fudge coated in milk chocolate with a dashing of salt. Grease an 8 inch square baking tin and line with baking or parchment paper. Place a medium saucepan on a low heat and slowly melt the butter. Once melted, add in the condensed milk, golden syrup and sugar. Stir until combined and the sugar is dissolved. Add a pinch of salt. Turn up the heat to medium and continue to stir until the mixture is simmering and starting to thicken. This may take a while, 5-6 minutes or so. Remove the caramel mixture from the heat and stir in all the pieces of white chocolate until melted. Pour the fudge into the prepared tray. Smooth the top and then sprinkle salt over the top. Place in the fridge for 3-4 hours to set or overnight. Line a cookie tray with baking paper and then chop the fudge into small, bite-sized pieces. Pop them onto the tray and add them to the freezer while you melt the milk chocolate. I like to use the stove top method so the chocolate stays warm. Place a small saucepan on medium heat with about 5cm or 2 inches of water in the bottom. Pop the chocolate into a small heatproof bowl and place the bowl on top of the saucepan, ensuring the bottom of the bowl will not touch the water below. Gently stir as the steam slowly melts the chocolate and it becomes silky and smooth. Once the chocolate has completely melted, remove the saucepan from the heat but keep the bowl on top. Grab the fudge from the freezer and one at a time, pop them into the chocolate. Swirl each one around until it is fully coated and then lift it out with a fork and place it back onto the tray. Before the chocolate fully sets, add a sprinkling of salt on top. Continue until you have done all the fudge and then place them back into the fridge to fully set for another 20 minutes. So glad you enjoyed them Vanessa! These look so delicious, Jess! I love that you did a milk chocolate coating. I’m usually a dark chocolate person, but when it comes to chocolate covered caramel, milk chocolate is just a classic! You’re speaking my language!!! 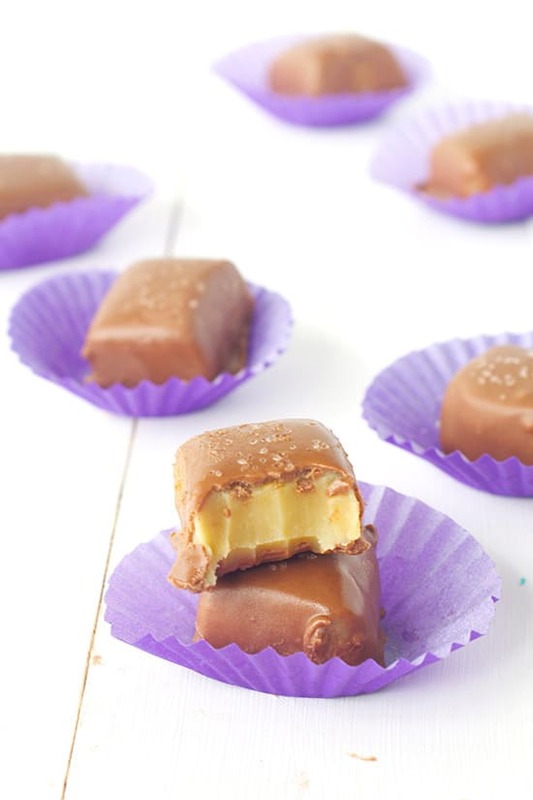 I adore anything caramel and chocolate—must make these soon!!! Is there something I could substitute with the golden syrup? I love the display of this. The deep chocolate and purple is always a great combination of colors. Hi Linda, thanks for your comment. Golden syrup is made from cane sugar and has a similar colour and thickness to honey. I looked around online and a few sources recommend exchanging it like for like for corn syrup however, I haven’t tried this myself. Golden syrup does have a sweet and rich flavour which adds to the ‘caramel’ flavour in this recipe, which I’m not sure corn syrup would do. Perhaps treacle if you have access to it? Otherwise you can track it down at an international grocery or candy store? 🙂 I’m sorry for the confusion! I didn’t realise I golden syrup wasn’t readily available in some countries! Caramel + chocolate — the BEST! Looove the sprinkle of salt on the top to balance everything out too. I don’t think I’ve ever had a caramel fudge, so I absolutely cannot wait this. BEAUTIFUL, Jess! That silky smooth texture looks amazing! I’m sure I could eat quite a few of these candies! Yum! Little sweet chocolate treats like this are always on the agenda for me.. so I have to make these. Could these look MORE enticing?! I think not! I HAVE to make these!! OMG I’m beyond excited! These would make great gifts. Could you please explain more about golden syrup? What is it? Thank you! I wish I had a handful of these right now! What’s not to love about chocolate and caramel?! Aw thank you Amy! It is such a yummy recipe! Oh I love fantales and wethers! 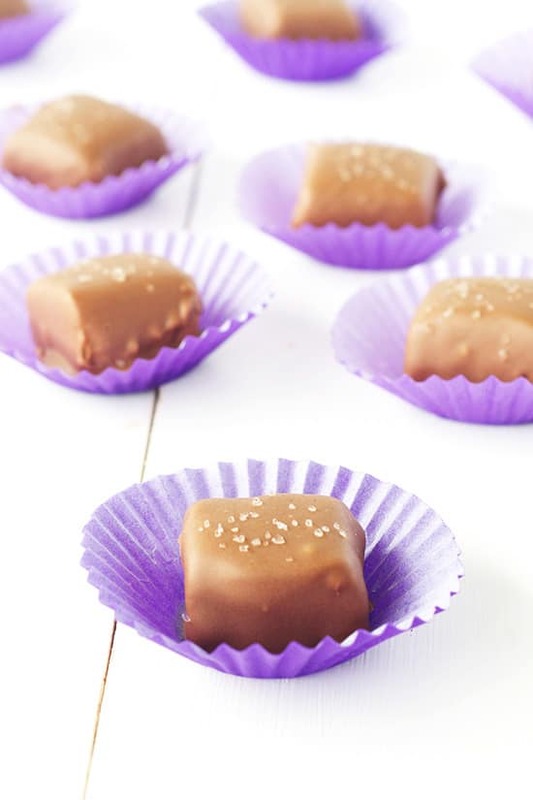 And those pascall caramel chews – these fudge bites are just like them! Oh my goodness, I had no idea fudge was so easy. I nearly bought a tiny packet of it for $12 at the night market. So glad I didn’t. This looks incredible.